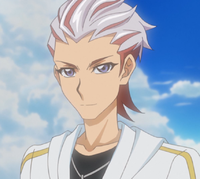 Takeru Homura (穂（ほ）村（むら） 尊（たける）, Homura Takeru), known as Soulburner (ソウルバーナー, Sōrubānā) in LINK VRAINS, is a character in the second season of the Yu-Gi-Oh! VRAINS anime. He is one of the victims of the Lost Incident, and he is partnered with an Ignis, Flame. Inspired by Playmaker, Blue Angel, and the Gore's fight against the Knights of Hanoi, he transfers to Den City High School to aid Playmaker. Yu-Gi-Oh! VRAINS episode 48: "Judgment Arrow"
Full views of Takeru, both in reality and as Soulburner. Takeru is a fair-skinned bespectacled teen with grey eyes and dual-layered hair; the more predominant top section is silver, while the bottom layer is reddish-orange. He has five prominent, but short, spiky locks in his bangs; the outer two frame his face, while the central three curve to the left of his head in a similar style to Yugo. He wears ovular green-rimmed spectacles that leave the base of the lens exposed. 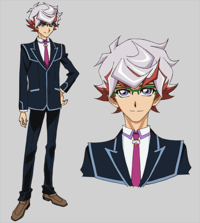 Takeru wears the Den City High School boys' uniform with a lavender-lined collar and pink tie, but more neatly than the disheveled Yusaku Fujiki; his shirt is tucked in, his coat is closed, and he wears more formal brown shoes. As Soulburner in LINK VRAINS, he removes his spectacles and his eyes turn gold. His hair becomes slightly longer and his central bangs reverse direction and become more angular. The upper layer of his hair becomes turquoise, while the bottom layer and his eyebrows both become blue and more prominent. His bangs become red; the framing bangs are shot through with orange, while the central bang turns orange. Soulburner wears a grey jumpsuit patterned with orange flames licking the limbs, red rib sections, and a yellow arrowhead shape running down his chest with a triangular aquamarine gem in the center. He has red shoulder-pads, greaves, and a gauntlet on his left hand and an elbow-guard on his right arm, which is bare to the wrist. Soulburner wears gloves with a similar basic design; the one on his right hand is a fingerless red glove with orange knuckles and a square-shaped section missing from the back of the hand, and the one on his left is black, with red knuckles and a red patch on the back of his hand. He also wears red boots with grey, orange-lined tongues and orange soles. Soulburner wears an unusual scarf around his neck that appears to "flicker"; small sections either hover separately as if they were attached or are constantly emitted. A young Takeru recovering in the hospital after the Lost Incident. Takeru was one of six children kidnapped during the Lost Incident, during which he was subjected to experiments via VR Dueling. After being recused, he was taken to recover in the hospital. His grandparents came to visit him and later took him home, tearfully informing him that his parents had died in an accident while searching for him. Takeru deciding to take action. Takeru lived with his grandparents for ten years, but often skipped school and believed his life had effectively been at a stand-still since the Lost Incident. He also gave up Dueling. After seeing news reports of Playmaker, Blue Angel and the Gore battling the Knights of Hanoi, he was inspired to take action himself and began Dueling again. He was contacted by Flame, an Ignis that was based on him that was created as a result of the Lost Incident. He was confronted by his friend, Kiku about skipping school and he informed her he was leaving and asked that she look after his grandparents for him. She agreed, saying he seemed much more full of life than usual. He departed with Flame in to, wishing to aide his heroes. After defeating the Gore, Playmaker and Soulburner met again, and managed to enter the unknown world through its portal. Immediately after arriving, they were hit by strong winds, which forced Ai and Flame to protect them using Data Storms. At some point, the winds stopped, and they were able to reach a temple where they finally found the wind Ignis. After showing them the world he had build, the Ignis (who decided to call himself "Windy") explained how he did that in order to attract his fellow Ignis, and also to lure the responsible for destroying the Cyberse World. Despite not knowing who was the responsible, Flame pointed out they were after Bohman, who not only had stolen Jin's consciousness, but also had the card used to destroy the Cyberse World, and suggested he could've escaped to a world inside Windy's world. They then asked Windy to join them, which he promptly refused, as those statements had no evidence. However, Windy said he could weaken the winds near the area where Bohman supposedly escaped to, under the condition that Playmaker and Soulburner defeat the two invaders, Ghost Gal and an unknown partner. Upon making contact with the girls, Blue Girl presented herself as actually being Blue Angel. Soulburner was happy to meet another savior of the old Link VRAINS, but Blue Girl stated they were actually seeking to retrieve the Ignis. While both Playmaker and Ghost Gal were willing to solve the situation without Dueling, Soulburner accepted Blue Girl's challenge. Knowing of Blue Girl's Trickstar Deck and its burn tactics, Soulburner attempted to take the first turn by challenging Blue Girl to a small race, but was overwhelmed by the terrain and lost. From the very beginning of the Duel, Blue Girl was planning ahead to counter his strategies of swarming the field with "Salamangreat" monsters, and his Skill. Soulburner was pushed into a corner by all accumulated burn damage caused by "Trickstar Divaridis" and "Trickstar Lycoris", and even "Salamangreat Heatleo" was unable to destroy them due to Blue Girl using "Trickstar Calobane". Despite making no progress, Flame still assured they had an advantage, since Soulburner had Flame himself by his side. After nearly being defeated by Blue Girl's Fusion Monster, "Trickstar Band Sweet Guitar", Soulburner listened to Flame's advice and used his Skill, managing to draw "Fusion of Fire". By using it, he fused "Heatleo" and Blue Girl's "Divaridis" into "Salamangreat Violet Chimera". In the final attack, Blue Girl attempted to reduce the damage by using "Calobane" again, but this was predicted and countered by Soulburner, who used the effect of "Violet Chimera" to double its ATK, and drop her LP to 0 in a single attack. After the Duel, he approached the fallen Blue Girl to compliment her for becoming much stronger, before forcing her log out. Ghost Gal then returned, amazed by the Duel's outcome and aware she wouldn't be able to go any further without her partner. Flame then gave her a copy of Blue Girl's evacuation program, allowing Ghost Gal to log out safely. 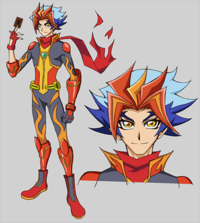 Takeru (as Soulburner) with "Salamangreat Heatleo". Takeru uses a Cyberse Beatdown Deck, focused on the "Salamangreat" archetype. His Skill is "Burning Draw", which allows him to give up LP to draw more cards, so he includes cards that restore his LP. His "Salamangreat" monsters often have effects to Special Summon themselves from the Graveyard, allowing him to amass them to Link Summon "Salamangreat Heatleo". Takeru can also use Ritual Summoning, Fusion Summoning, Xyz Summoning and Reincarnation Link Summoning to bring out stronger monsters. In the past, Takeru played a different Deck, focused on FIRE Warrior monsters. ↑ 4.0 4.1 Yu-Gi-Oh! VRAINS episode 52: "Hero in Name Only"
↑ 1.0 1.1 This card is drawn in episode 49, but he is unable to play it due to the effect of BitBoot's "D-Scale Chaff".